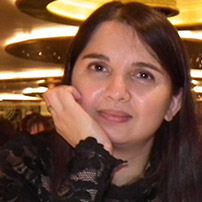 Rohini grew up in India and moved to the UK in 1991. She has a BSc. in Statistics from Bombay University and is also an alumnus of Indian Institute of Management – Bangalore. She has two decades of experience working within a global equity team at a London based fund manager. She is a passionate proponent of responsible capitalism and sustainable investing. She intends to use her experience to help others, as a business and life coach, to discover and fulfil their own potential. Leading Ladies: inspiring stories of women who found their purpose with passion is her first book. Rohini is also the founder of UK based charity Raindrop Campaign focused on changing lives of children in neglected and impoverished communities in India through education.